Hello, everyone. Welcome to episode 176 of Against the Odds. Last week, we had our second all-Ravnica Allegiance Against the Odds poll, and it wasn't even close this time: Captive Audience topped Teysa Karlov by more than 700 votes out of the 7,000 cast. 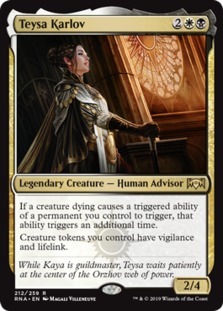 As a result, we're heading to Ravnica Allegiance Standard this week to take our opponent captive and force them into making some tough choices. The main plan of our deck is to disrupt our opponent in the early game with removal, ramp into Captive Audience, and trust that the enchantment will win us the game pretty much by itself over the course of a few turns. 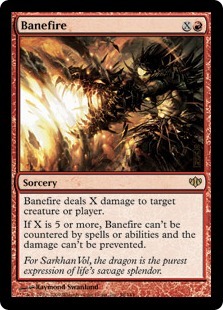 If that doesn't work, we can always just cast a massive, uncounterable Banefire at our opponent's face or go on the beatdown with Karn, Scion of Urza tokens. 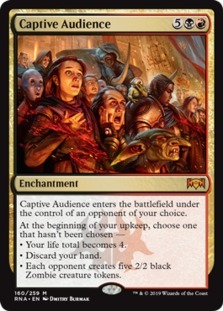 What are the odds of winning with Captive Audience in Standard? Let's get to the video and find out; then, we'll talk more about the deck! Captive Audience is an interesting card to build around, since it has a couple of weird requirements. First, since it's seven mana, we need some sort of ramp to cast it consistently, so one of the biggest challenges of building around the card was figuring out the colors. Going three or four colors offers more ramp options but less consistency. Thankfully, mana rocks like Chromatic Lantern and Gilded Lotus give us good ramp spells that can fit into any deck, which allowed us to end up with a straight Rakdos deck. Second, the fact that Captive Audience puts our opponent down to four life means that there isn't much value in dealing damage to our opponent in the early game, since all of that damage sort of goes to waste once our opponent has to chose the "your life total becomes 4" option on Captive Audience. As such, instead of playing any early-game creatures, we're overloaded with card draw, card filtering, ramp spells, and removal. In the end, Captive Rakdos is basically a weird hybrid of Rakdos Control and Rakdos Ramp, with Captive Audience being our primary way to win the game. Captive Audience is a super-unique card. It offers way more than seven mana's worth of value, but it does so slowly and in a way that your opponent controls. In theory, for seven mana, we get something like 10 power and toughness worth of Zombie tokens across five bodies, something like 16 damage to our opponent's face, and a Wit's End, which should be enough to win the game all by itself, at least in some circumstances. The awkward part of Captive Audience is that it usually isn't good until the second or even third mode is chosen. 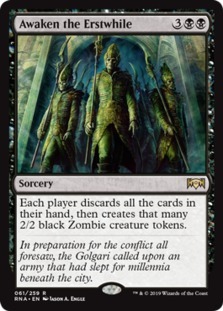 Against many decks, by the time we cast a Captive Audience, our opponent will already be close to empty-handed, while other decks have sweepers to make the Zombie choice less painful. 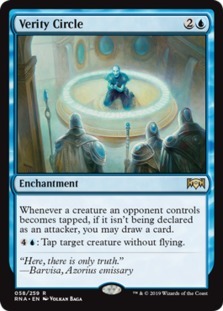 As such, Captive Audience is often "you win the game" for seven mana with suspend three. The other challenge of Captive Audience is that thanks mostly to Wilderness Reclamation, people are prepared to deal with enchantments. Cards like Mortify, various planeswalkers, and Knight of Autumn all show up in top-tier decks. As a result, we also have some games where we invest seven mana into Captive Audience only to see it immediately die. 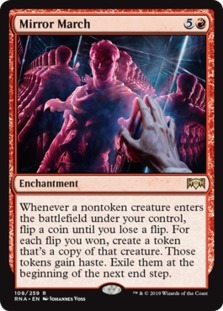 Because of this, it's important to have a lot of card draw to find multiple copies of Captive Audience, so even if the first one dies, the second will hopefully finish off our opponent. 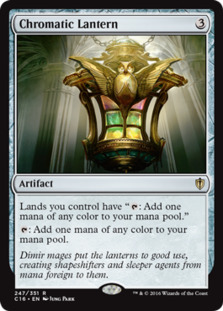 As far as ramping into our Captive Audience, we have Chromatic Lantern and Gilded Lotus. 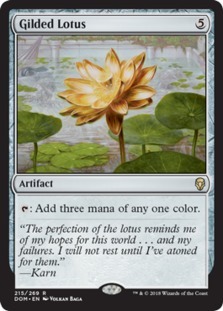 In theory, these cards let us get down a Captive Audience as early as Turn 5, with Chromatic Lantern giving us the mana to cast Gilded Lotus on Turn 4 into Captive Audience on Turn 5. Apart from Captive Audience, both cards are also essential to our backup Banefire plan by ramping us into our huge, uncounterable burn spell. 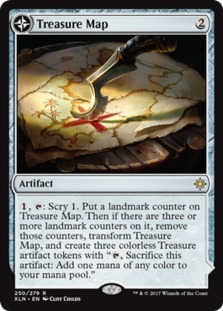 As artifacts, they also have some upside with our card-advantage engine, which we'll talk more about in a minute. When it comes to closing out the game, apart from just winning with Captive Audience itself, our main plan is to Banefire our opponent's face. Ideally, we'll get our opponent down to four life with the help of our namesake enchantment, and then we can use an uncounterable Banefire to close out the game. The other upside of Banefire is that we have a ton of ramp in our deck, so it's actually possible that we can get up to 21 mana and it can simply kill our opponent all by itself. As we talked about in the intro, thanks to Captive Audience putting our opponent to four life, getting in creature damage in the early game isn't all that valuable. 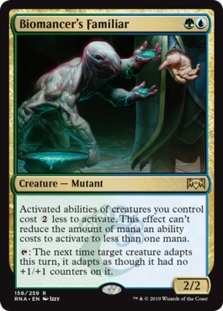 As such, instead of playing creatures, our early game is focused on drawing into our Captive Audience and finding enough removal to stay alive until we cast it. 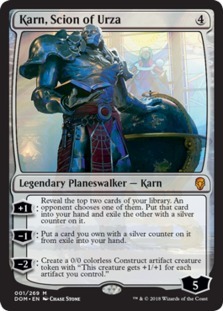 Karn, Scion of Urza gives us a card-advantage engine that also works as a backup finisher. Since we have a bunch of random artifacts in our deck, the Construct tokens it makes are often big enough to take over the game. 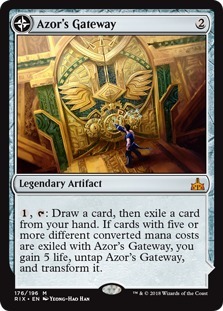 Meanwhile, Treasure Map and Azor's Gateway give us early-game card filtering that also works with Karn, Scion of Urza and even function as backup ramp spells once they flip into lands. Together, these cards help to smooth out our draws, make sure that we find enough early removal to stay alive, and then eventually help us ramp into our Captive Audience to close out the game. Otherwise, our deck is overloaded with removal of various kinds. 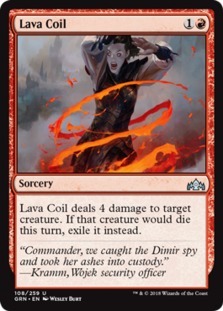 Cards like Lava Coil and Bedevil keep us alive in the early game, with Bedevil also offering a nice hedge against planeswalkers, which is important, since cards like Vivien Reid, Vraska, Golgari Queen, and Teferi, Hero of Dominaria offer our opponent a way to get Captive Audience off the battlefield. 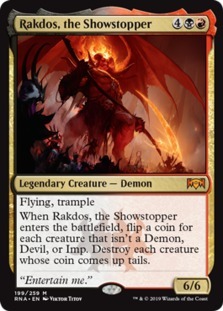 Meanwhile, we have a single creature in the deck in Rakdos, the Showstopper, which is basically a really random half-Wrath of God that comes along with a big flying body. Since we don't have any other creatures, Rakdos, the Showstopper's enters-the-battlefield ability is all upside—with some luck, we can blow up our opponent's entire board, while even just getting rid of a creature or two still offers decent value when attached to an on-curve flying body. Captive Rakdos is great against midrange and pretty good against control as well. Against these slower decks, we can use our removal to stabilize in the early game and then eventually take over with Captive Audience. On the other hand, aggro can be more of a challenge. While we have removal for the early game, we don't really have a way to gain life or close out the game quickly, so there's a risk that we end up getting burned out by cards like Skewer the Critics and Lightning Strike as we are digging through our deck to try to find a finisher. The Turbo Fog matchup also seems rough on paper, especially in game one, but based on our experience playing the deck, it might be more winnable than it looks. All in all, we played five matches with Captive Rakdos and won four of them, giving us an 80% match win percentage, along with winning nine of our 13 games, good for a roughly 70% game win percentage, making Captive Rakdos significantly above average for an Against the Odds deck. While we probably got a bit lucky with our matchups, playing mostly midrange and control decks, we also played mostly top-tier decks and managed to take them all down except for Mono-Green Stompy. As for Captive Audience itself, it died a lot more often than I would have liked to cards like Mortify, but thanks to all of the card draw in our deck, it wasn't too challenging to find a second or even third copy. The good news is that if we can stick it on the battlefield for a couple of turns, it pretty much does win the game by itself. It's also hilariously good against Turbo Fog (assuming we can get it on the battlefield before they combo), since as our opponent takes their extra turns, they eventually have to discard that hand, which hopefully fizzles the Nexus of Fate loop and gives us a chance to untap and win the game with our board full of 2/2 Zombies. Basically, Captive Audience was a lot more competitive than I expected and super fun to play as well! While we'll get back to normal polls with a mixture of sets and formats before long, there are still a ton of spicy Ravnica Allegiance cards left to play, so let's cross another off of our list next week. Which one of these cards should we build around in Standard next week? Let us know by voting below!